A feast for the eyes and mind, FRIDA: ¡VIVA LA VIDA! 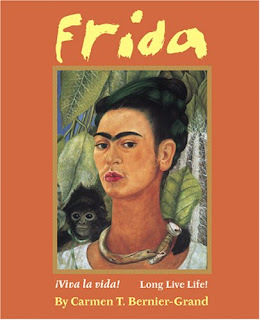 by Carmen T. Bernier-Grand (Marshall Cavendish), portrays the life of painter Frida Kahlo through poetry, photographs, and reproductions of the artist's work. Bernier-Grand's terse, powerful verses convey Kahlo's strength, beauty, and passionate need to paint, despite a life of suffering and sorrow. Inspiring for teens and adults alike, this Pura Belpré Honor book explores the tension between love and art—apparently they can feed and destroy each other, but can never live apart, much like Kahlo and her husband, painter and muralist Diego Rivera.